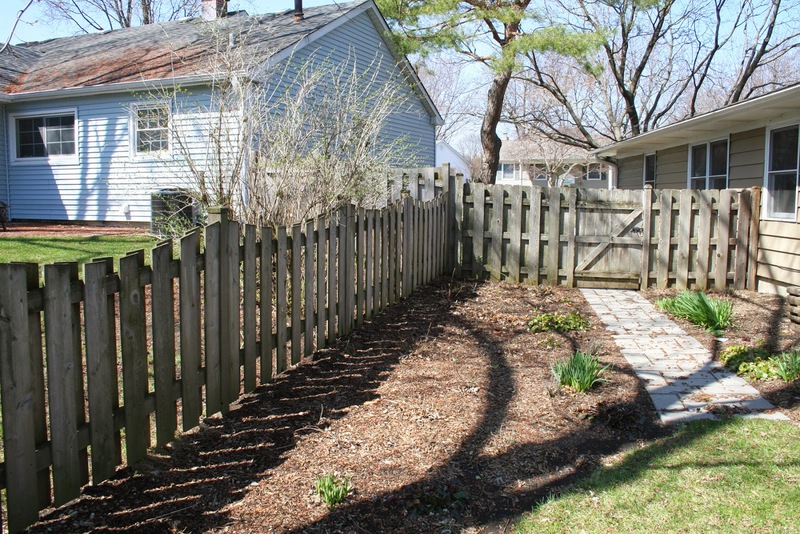 When we moved into our house in July 2012 I was a little overwhelmed by all the garden space, most of it overgrown with prairie plants or empty. After clearing out a lot of dead/scraggly plants we were left with a lot of bare ground, which I've been slowly filling the last two years. 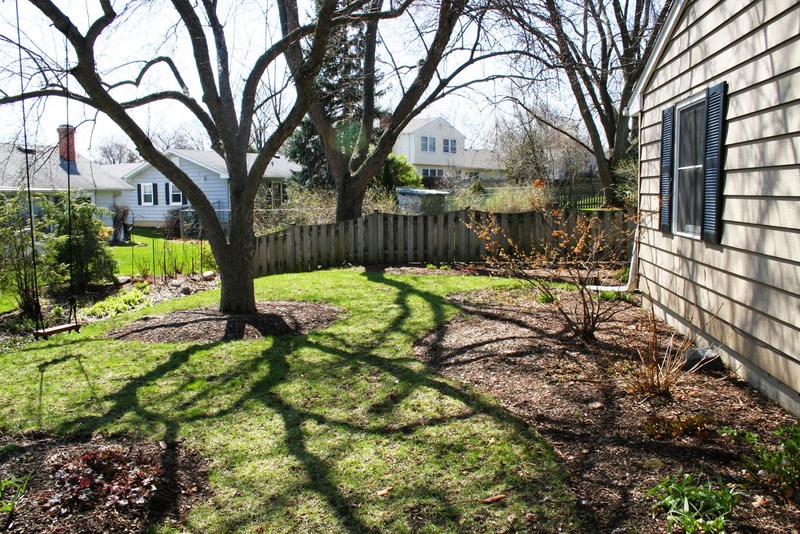 The April garden is mostly brown, starting to green up in a few places. Below some Allium foliage and hellebores are peeking through, and on the left the rusty foliage of Coral Bells is starting to brighten a little. This is my favorite garden, the one that's gotten the most attention but suffers from a lot of small perennials still needing time to fill in. There are still a few empty spaces as well. Another view of the same garden. 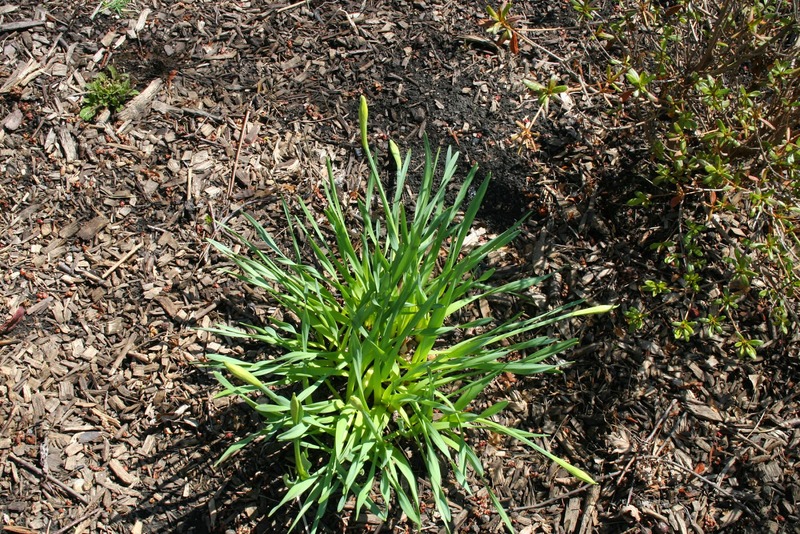 Daffodils and Asian Ginger are doing their best, and the other perennials are just starting to come in. Salvia, lemon balm, sage, pincushion flower, and various sedums are just getting started. 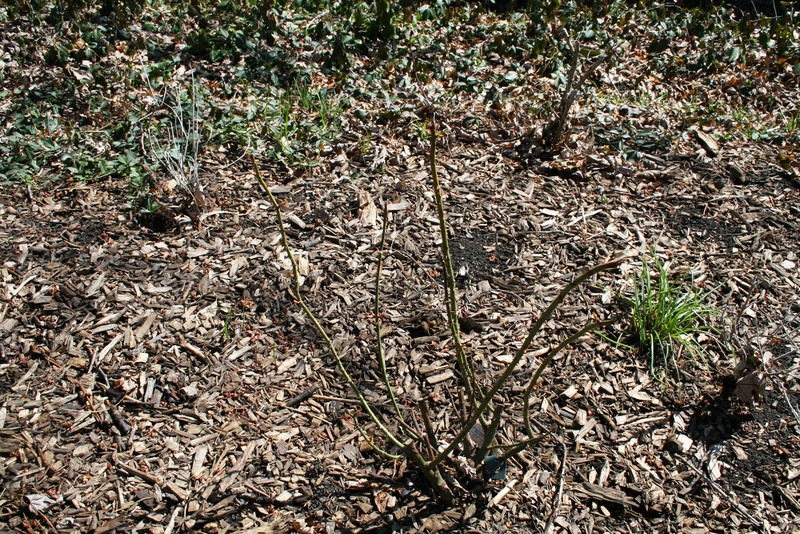 The hydrangeas have tiny green buds and the roses are starting to set laterals. Against the two sides of the garden gate fence are two climbing roses (New Dawn). I bought them as bands in summer 2012, and it's taken them some time to establish. I had blooms last year, but I expect a big growth spurt this year - and to spend some serious time training and pruning from now on. 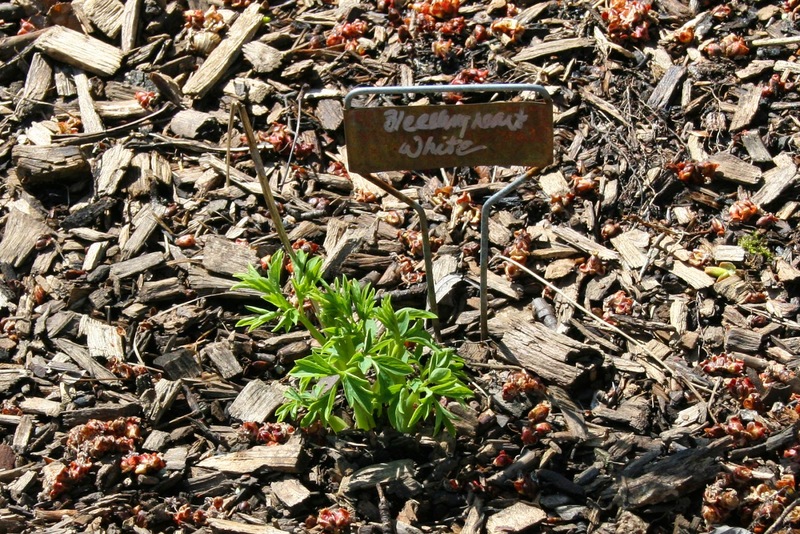 Bleedingheart Alba, planted bareroot in fall 2013. 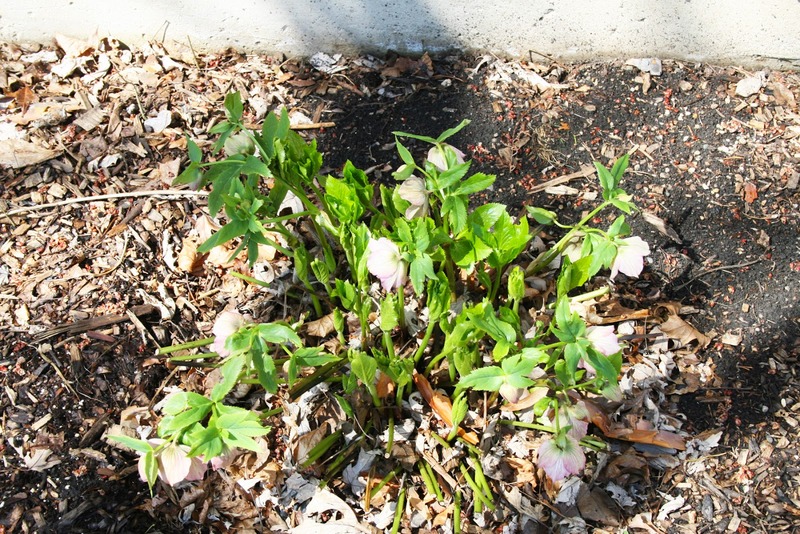 Hellebores, recovering from a drastic cutback of their browned winter foliage. 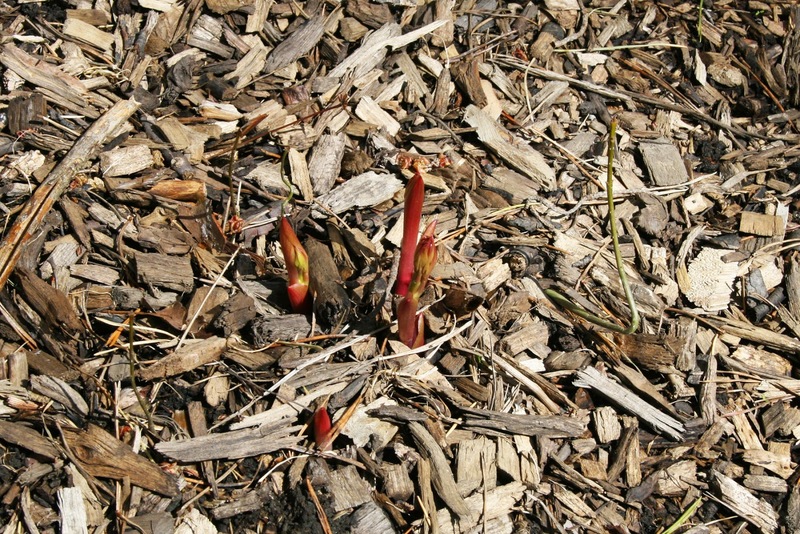 Peonies, planted bareroot in fall 2013 and finally showing a few good sprouts. I'm really hoping for blooms this year, although last fall I moved a few around and that may mean no flowers until next year. When I moved them I dug up huge chunks of soil around them, trying to keep the tuber/root system as undisturbed as possible. 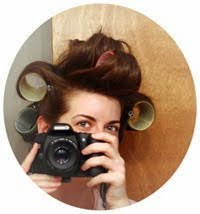 But plants are tricky, so the tradeoff is there. Daffodils! I don't love them, honestly, but they're one of the early risers so I keep them. I wish the foliage didn't get so scraggly after they bloom. 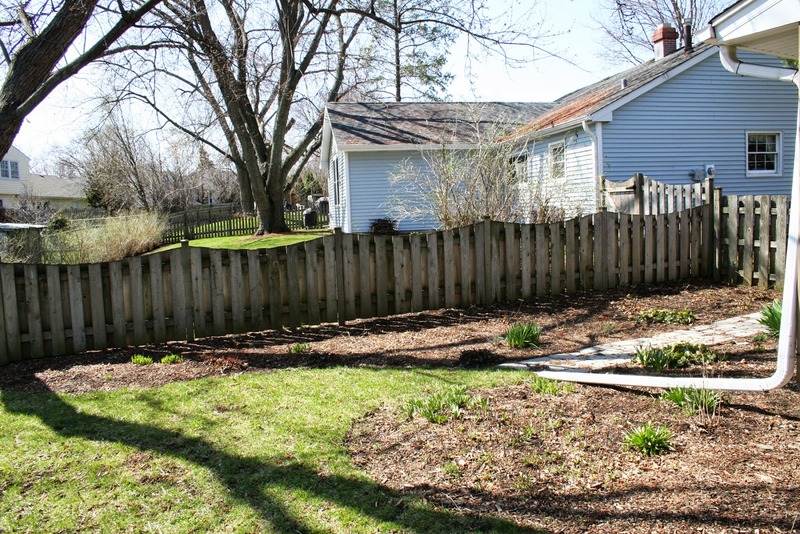 Also pictured: a Nepeta catmint in the upper left, and a white azalea on the right, planted in spring 2013. Last year we had a late spring and the azalea never did bloom. This is one of my David Austin roses (Alynwick), planted bareroot in June 2014. It came with a fairly sizeable root system and managed to bloom twice last summer. This year it, along with its friends, are bigger and hopefully will put on more of a show. The other Austins I have so far are: Winchester Cathedral, Asma Sharifa, and James Galway. All own-root for my Zone 5 garden.